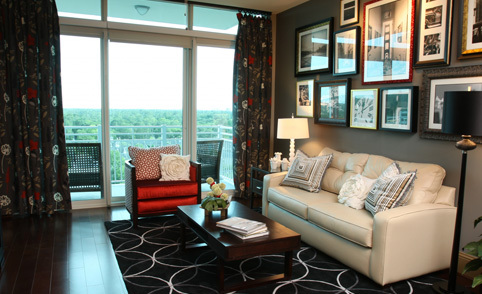 Defining a luxury apartment is an important step when trying to find your new apartment in Houston. Luxury entails top of the line amenities, great location, beautiful designs, and enjoyable nearby dining and entertainment. Good service is something that is also very important, such as a concierge that can help you with any questions you have of the area and recommendations of places to go. Luxury also brings to mind a fully equipped gym, a relaxing spa with high quality products and large pool. In Houston, the zip code 77024 is one of the most affluent places in the country, where the privileged live a life of luxury, comfort, and pleasure as they enjoy everything their apartment community offers. With all of the above prerequisites for a luxurious apartment, discover two of Houston’s nicest new sites to live in! Apart from the definitions of luxury, The Fountains at Memorial City apartments have interior spacious floor plans, built in computer desks with granite slabs, balconies with amazing views, hardwood floors, and ceramic tile entryways. The kitchens are fully equipped with only the best quality appliances and materials. The Fountains includes an elegant clubhouse, resident lounge with wi-fi Internet and 24-hour coffee bar, 24-hour emergency maintenance, and panoramic views of downtown Houston. Check out MANY more amenities here! Cheval Apartments also offers all luxury amenities described above with much more to go beyond your expectations. Their resort style pool with infinity edge waterfall and their day spa with massage rooms and spa treatments will turn you into a health and fitness fanatic! Relax at the Starbucks coffee bar, clubhouse living room, or visit their video library. No one will ever be bored with Cheval’s never ending entertainment such as their game room with billiards, foosball and shuffleboards and their lighted tennis and basketball courts. Cheval also has a sand volleyball court and beach area offering non-stop activity. Interested in their whole list, click here! 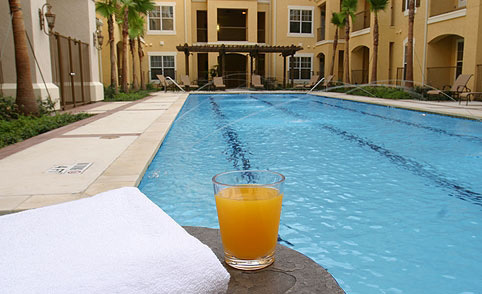 Luxury Apartments in Houston, Texas or anywhere in the United States, doesn’t get much better than this! No matter the age or interests of its residents both of these apartment communities in Houston will make anyone not want to leave their home. Having the opportunity to live among the high society of Houston and a sophisticated quality of life, you wont have to look much farther than Cheval Apartments or The Fountains at Memorial City. Visit Lincoln Property Company and contact both today!